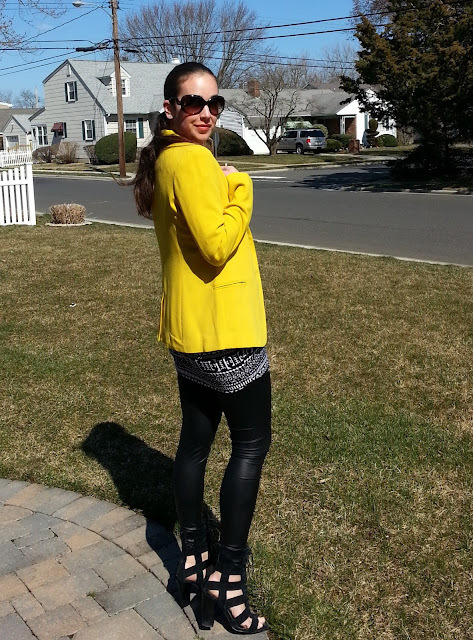 East West Mama’s: A Collaboration of Style and GIVEAWAY! The trendy online store Flat84 so kindly sent Tanya and I the same dress to feature for this months East West Mama’s collaboration. I was elated when I opened the package to discover the ever so popular black and white trend (which I obviously love from a recent post here). I was slightly deflated when I realized the size medium was positively innapropriate…my umentionables were completely exposed. I thought for a bit….maybe I could exchange it for something else….then realized..it would be super cute as a tunic. This is a good tip for many of us thirtysomethings and beyond. If you are loving a particular dress or have something in your closet that feels too short, remember you can always rock it with a great pair of leggings and in this case faux leather ones. It instantly makes the dress appropriate and super chic. Being as Tanya is more petite than I, the dress was the perfect length on her…hope you enjoy the way she styled it up on her blog here. She is looking amazing, right? No fair. It appears like Flat84 is transitioning from their winter to spring merchandise and spring items are sparse..but there are some serious deals to be had. For example, if you love the faux leather legging look…they have a cute pair on sale here. Or this super cute camo jacket which you can wear well into spring with t-shirts and boyfriend skinnies. Since we always seem to be in the giving spirit both Tanya and I are gifting the dress to one of YOU! 1. Must be a follower of TSF and November Grey by either Google, Bloglovin or Facebook- Just let me know in comment- You don’t need to follow all ways, just ONE. 2. Simply leave a comment below with your contact email. You know I want the dress. Loving this post!! You both look stunning! Have a wonderful weekend love!! Following on Google and FB and loving the black and white print! That is a lovely dress and the black and white with the yellow is such a striking combo! Need the dress! You know I follow. YOU are glowing!The splash of color is phenomenal!! You look GORGEOUS! I love how you styled this dress with the bright pop of color! I follow you both on GFC as Lynn. I follow you both on GFC and this dress is beautiful! I love how you both styled it! Your shoes are awesome too! You look beautiful! LOVE the blazer too! I follow you both on GFC. Such a cute dress and transitional love outfits like that! 12. This post is absolutely catchy for the visitors. I always come across interesting articles like this one. Keep the great work up! Next Next post: Camo, Leopard, Orange and SilverSpeck GIVEAWAY!